In my last post I mentioned how I was heading to the Grampians last week. I guess things went to plan, although the weather was suitably bonkers. How about 36 °C one day and 12 °C the next? In the end a few walks were done and one in particular will get a write up. A bit of an ‘off-track/not really’ stumble to Cathedral Rock was suitably entertaining. I’d post about it now, but there’s been a mild photo fiasco, so it might have to wait a week. Instead, I’ve opted for one of those entries that could be called a transitional post. 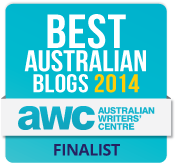 A bit of a spiel to keep the blog ticking over, whilst I sort out other stuff. 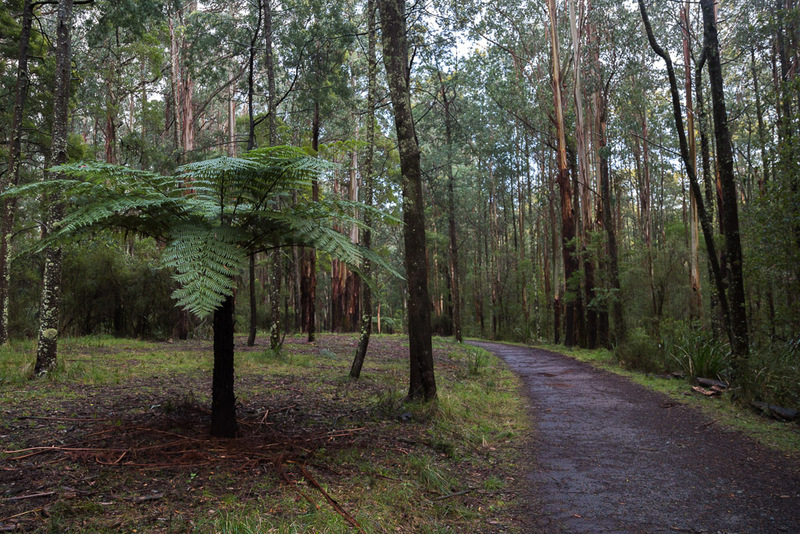 In winter, I did this Sherbrooke Forest wander in the Dandenong Ranges. 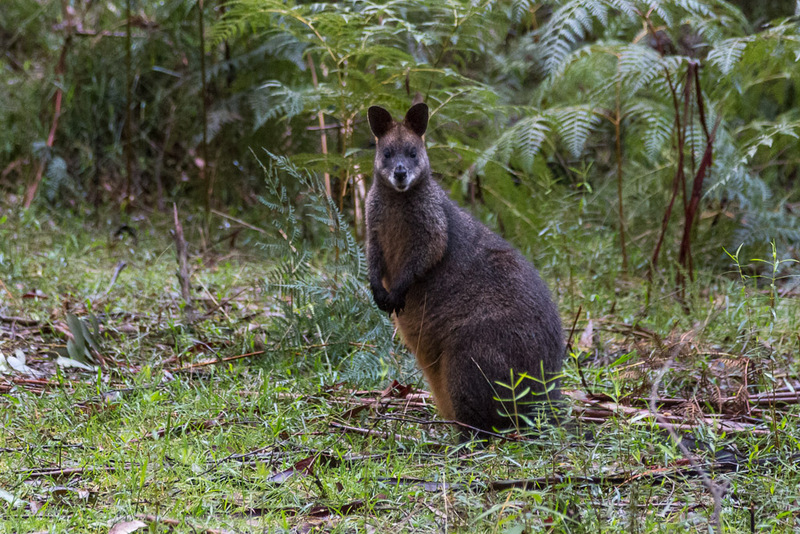 It had all the mid-year Dandenongs fare. 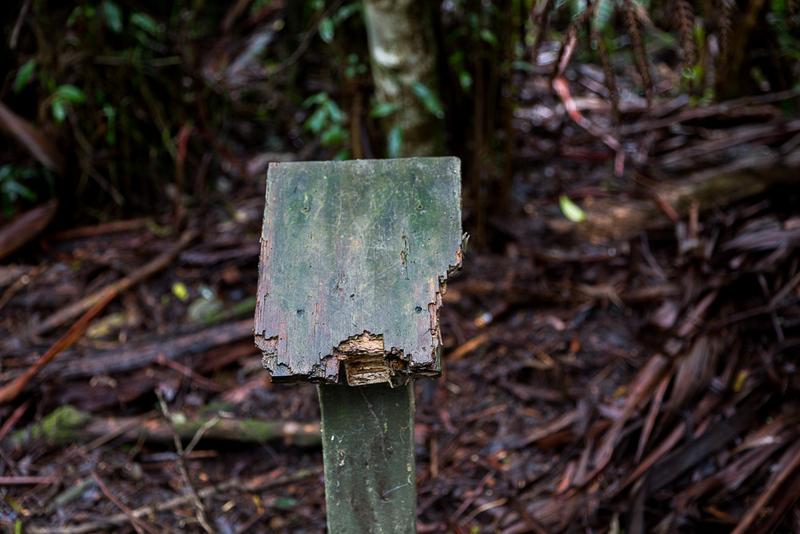 Mist, rain, mud, leeches and crayfish. Crayfish? Yeah, I’ll get to that later. 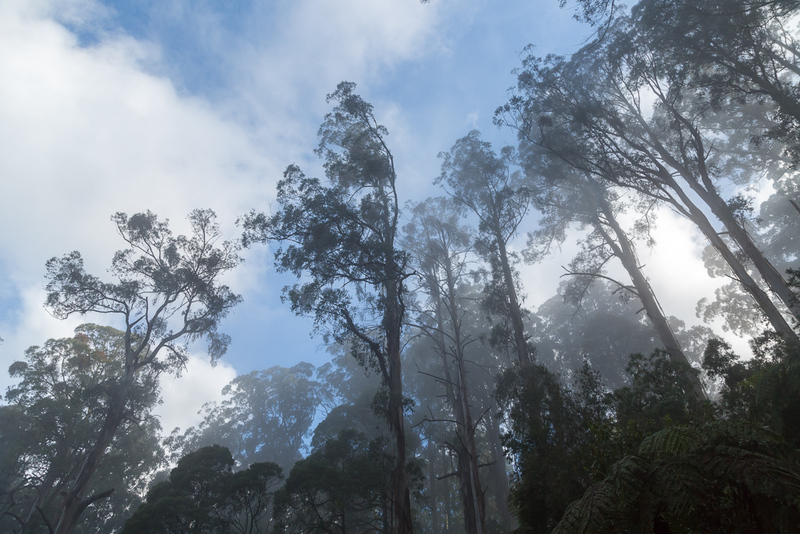 Oh, when I say this is a transitional post, I’m not in any way maligning the Dandenong Ranges. The last entry I wrote about the place, I took the piss out of it a little. As a result, I ended up with more abusive hullabaloo than with any other post. Truly, the rarefied air of the Mt Dandenong summit seems to make people cranky. So what’s this walk? Yep, I have to admit it’s yet another of GT’s walks from his out of print, ‘Daywalks Around Melbourne’. Man, those 100 walks the book contains are a tough nut to crack. I’m slowly chipping away at them though. He calls this one ‘Sherbrooke Forest West’. This of course is different to ‘Sherbrooke Forest East’, which I did about one million years ago and actually wrote about in the early days of the blog. 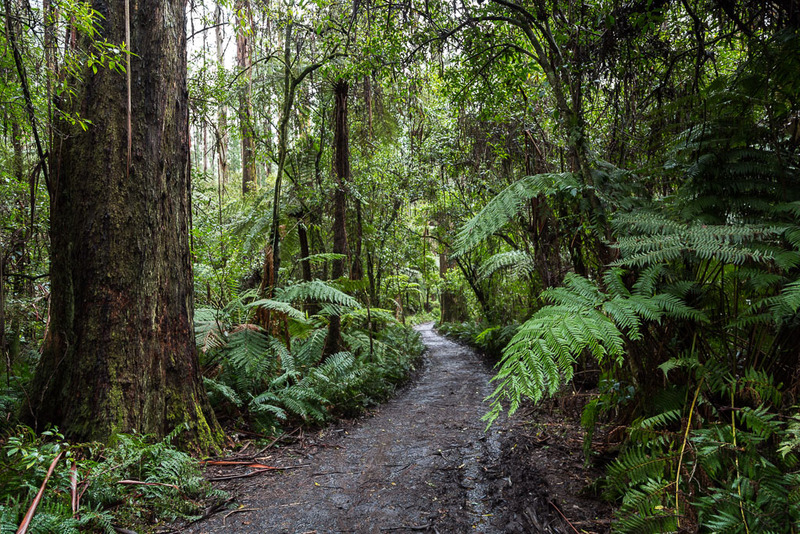 As I’ve mentioned in the past, a walk in the Dandenongs requires a bit of commitment when you’re living in the west. I’ve tried all sorts of variations of travelling there and none seem better than any others. It’s a long haul in the car and most of the time it seemed I was stationary at traffic lights. Eventually though, I made it and after having my passport and visa stamped, I arrived at my starting point. Grants Picnic Ground. If you’ve got an overseas tourist who wants to see Australian birds, then just drive them to this carpark. Within seconds of hopping out the vehicle, you’re beset by feathered fury. Dozens of cockatoos strolling around and the tamest kookaburras I’ve seen. Usually, if I go near one out bush, they take off in terror. Not this joint, as they seem to sit around nonchalantly. Mm… After saying this, I really should show you a photo of these multitudes of birds, shouldn’t I? Oh yes I should, but I don’t seem to have any pictures. I’ve no idea what happened, but maybe I was keen to get walking (as if). Heading off, first I had to cross Monbulk Road, which was interesting. I managed to eventually get to the other-side, by employing all the speed of an obese gazelle. 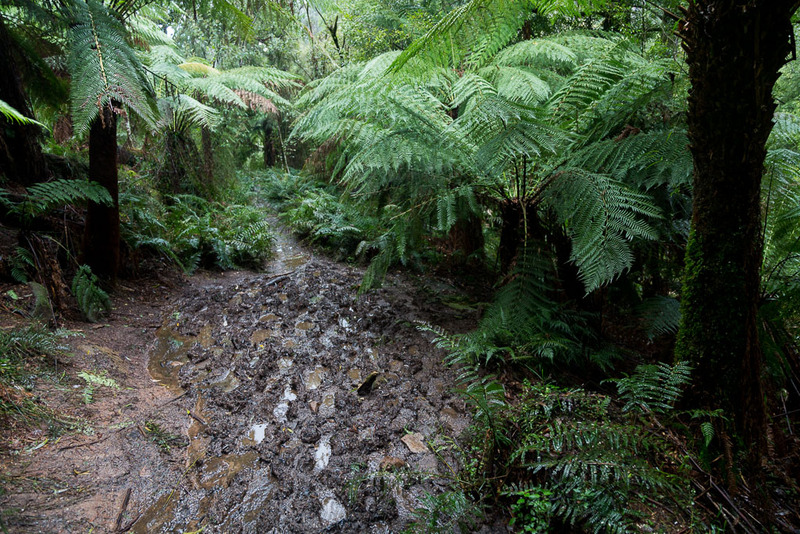 Soon though, I was entering Clematis Track and immediately it was Dandenong Ranges 101. Ferns by the hundreds, as I was swallowed up by the vegetation. As is the way, all of these walks seem to include a hill at the start. I’d barely shaken off the pooled blood from sitting in the car after 72 hours of driving, and I was heading upwards. Mind you, I had no idea what was going on, as the walk notes didn’t reflect what I was strolling on. Could I have got geographically embarrassed within ten feet? I quick consultation of the GPS confirmed I’d somehow missed a turn and was now headed somewhere. I’ve no idea where this somewhere was, but it was some place. I began to back-track to the route I needed, whilst wondering how I could have missed something that should be so obvious. I pondered the possibility of early senility, alzheimer’s or fallen victim to the Latin phrase, ‘haven’t got a clueis’. Actually, the worst thing about backtracking was the descending. It felt like I’d climbed part of a hill for no apparent reason. On every hike, I have a set amount of hill climbing mojo and I can’t afford to waste it for no reason. Now, what did I find when I reached the point where Clematis Track was meant to go? I peered at the GPS and the track was still there, but it wasn’t. The wheezing locomotive walking technique was in full swing, but I did stop for the odd photo opportunity. There seem to be more of these on inclines. I wonder why? 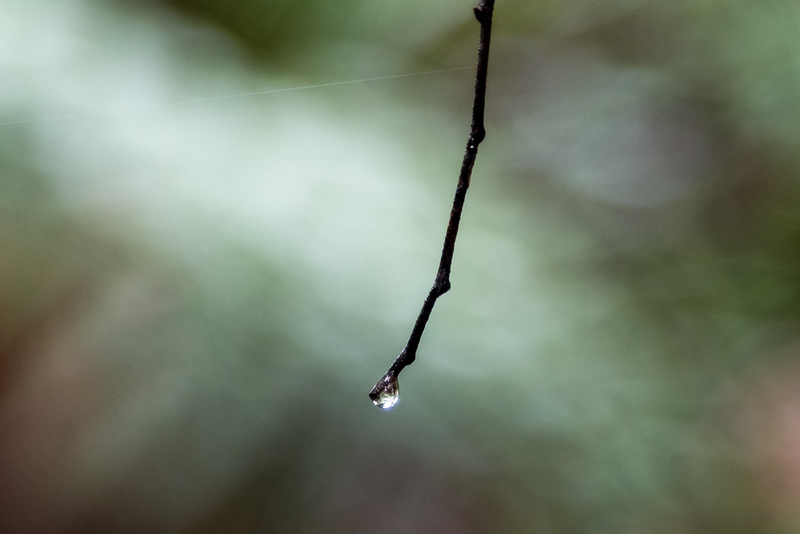 Anyway, I spent about ten minutes trying to get this stinkin’ water drop on the end of a twig photo. Eventually I got it, complete with a fine strand of cobweb that I didn’t notice at the time. The uphill saga ended when I reached a road and after a short wander alongside bitumen, I was heading back into the bush. Passing through O’Donohue Picnic Ground, it was cold and wet, so picnickers were in short supply. One needed a fur coat to stop and have their lunch here, but luckily for some, they came equipped with an outfit suitable for the conditions. 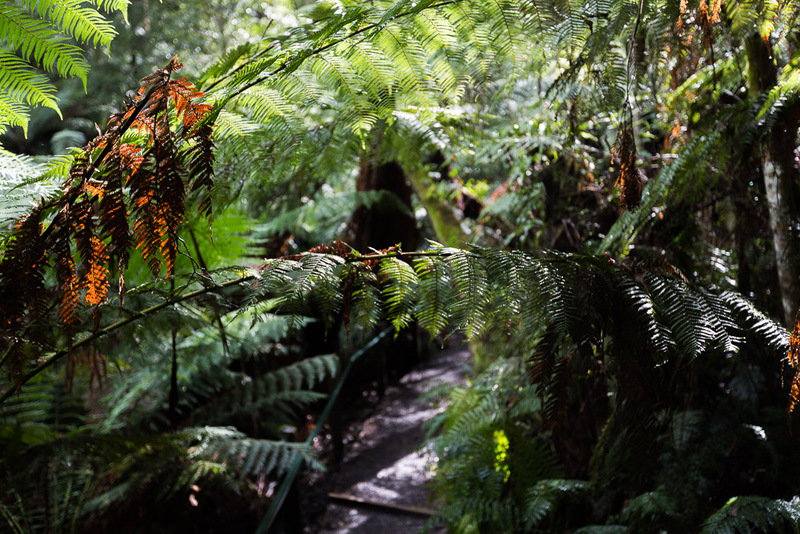 Leaving the tranquil picnic ground, I was soon back among the ferns. I’m not sure which track I was on though, as at some point I wandered along O’Donohue Track, Sherbrooke Track and Wattle Track. All within a few metres. If the signage was up to scratch, I might have known where I was. Unfortunately though, the information boards were a little light on details. Oh, sorry for the sentence a minute ago, where I bombarded you with the word ‘track’ a million times. It sounds like something Tony Abbott would write, with the same word repeated endlessly for no apparent reason. Moving on, I enjoyed this little part of the walk and if you’re a forest nut, you will also. 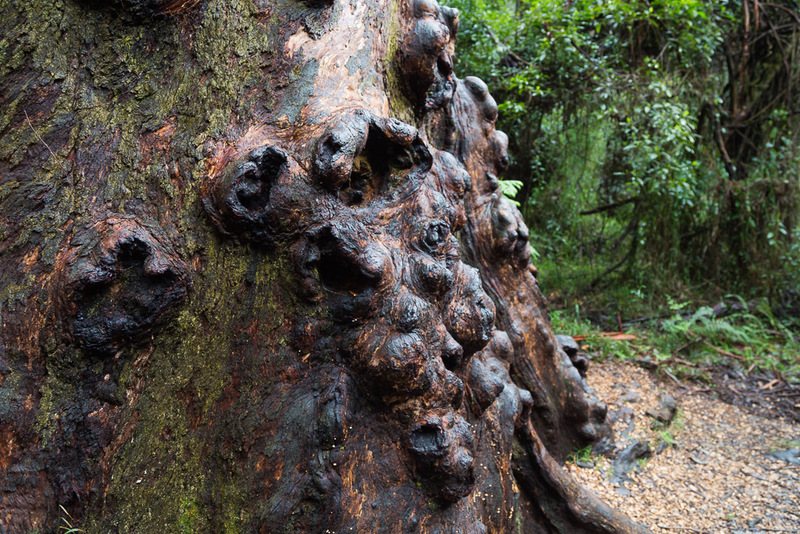 There was one enormous tree in this section, where the trunk had dozens of knobbly bits at the base. I assume ‘knobbly bits’ is not the correct term used by botanists, but at this stage it’ll do. 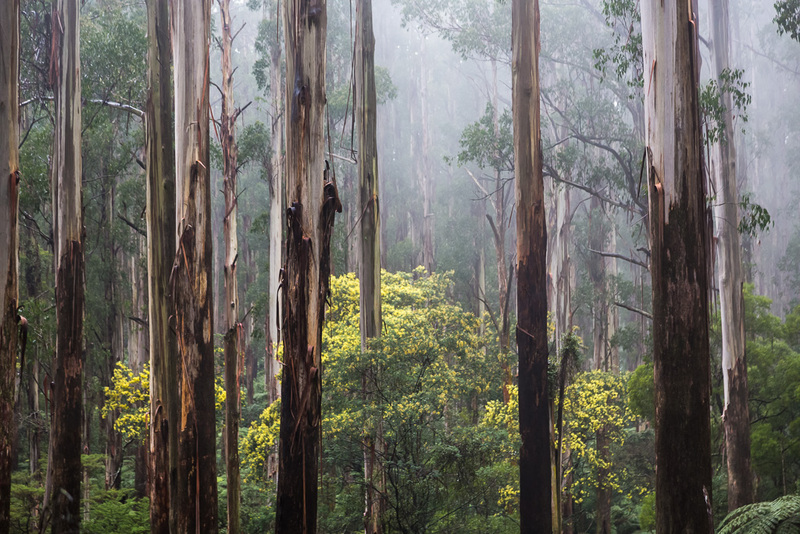 I think I prefer walks in the Dandenong Ranges to be wet and cold. Taking photographs in the winter conditions is a lot more fun. Sure, with the reduced light it can get tricky, as it took me quite a while to get the next one acceptably sharp. Then again, with digital, who cares? Just keep taking pictures until it works. 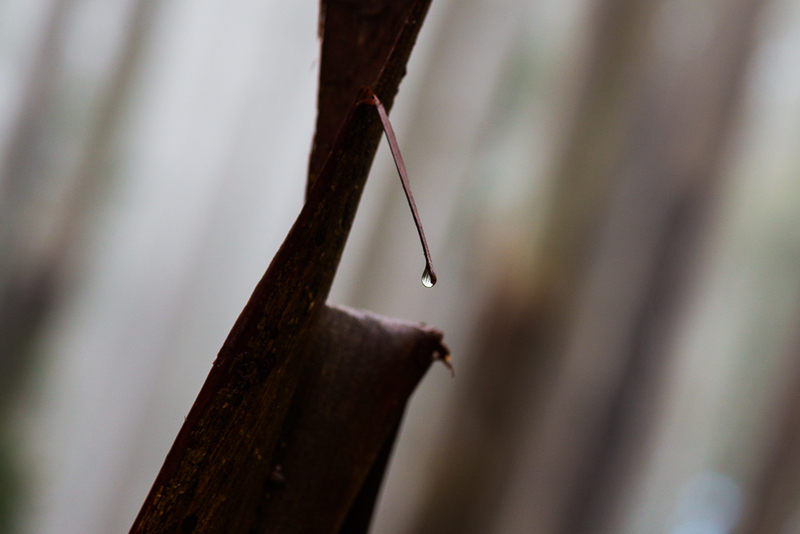 I was also indulging in my standard fetish of ‘water drop on a twig’ routine. This one though took some work. I stopped breathing for about five minutes, just so I could hold the camera steady enough to get it without blur. Finally, being able to breathe again was a bonus, as I motored on. 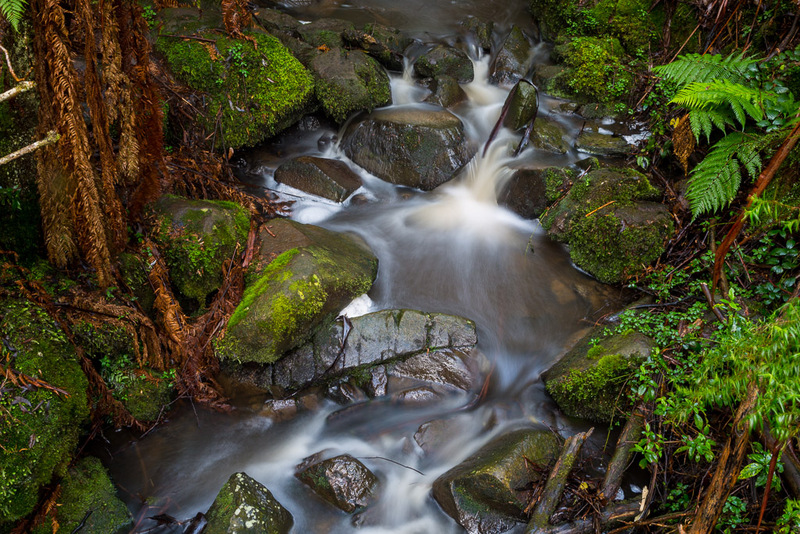 The camera was parked as I wandered next to Sherbrooke Road, before heading bush again along Hackett Track. Not too mention the towering mountain ash, where somehow I touched the heels of my boots with the back of my head in order to capture their height. I was now closing in on one of the highlights for the day. Sherbrooke Falls. I’d come equipped with a tripod, as I was sure they’d be some opportunities for slow shutter photography. 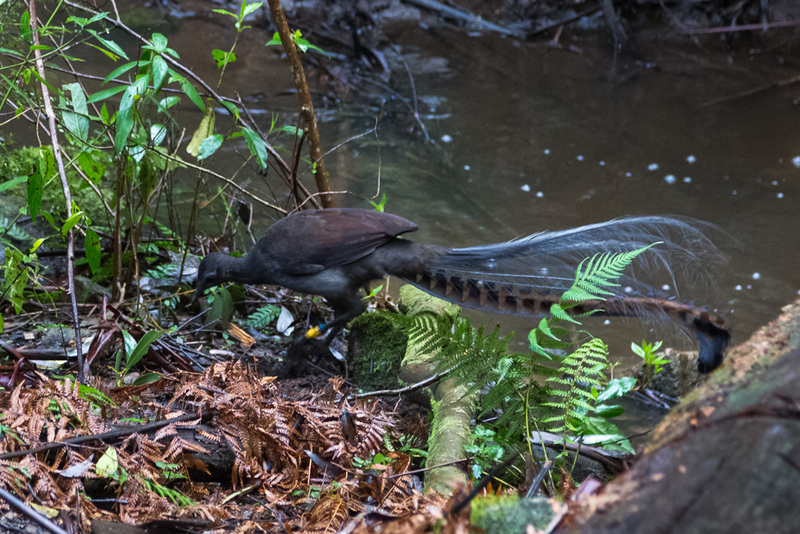 At one point, it was a pity the tripod wasn’t connected, as I spotted a lyrebird near Sherbrooke Creek. Moving around in a dark area, fossicking amongst the leaves was always going to be photographic challenge, so I did the best I could without getting too close. He might look a bit soft, but at ISO 2000 and not the fastest lens or shutter speed, I don’t think I could have improved it. Especially when hand held. The waterfall was close by and a weak, late afternoon sun was glowing in the trees. I wandered down the steps to a bridge over the falls. It was flowing quite well, but then again, it was the first time I’d seen it, so I’m not sure if it can be better. 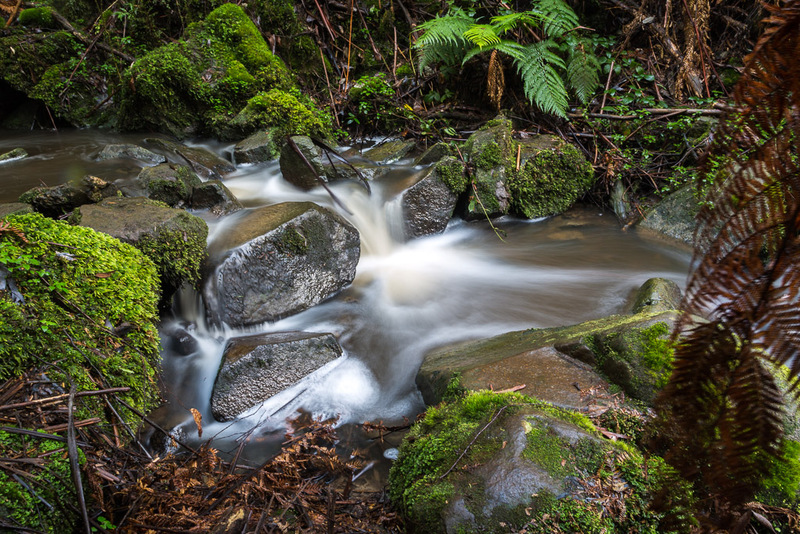 …and for water flowing over leaves below. 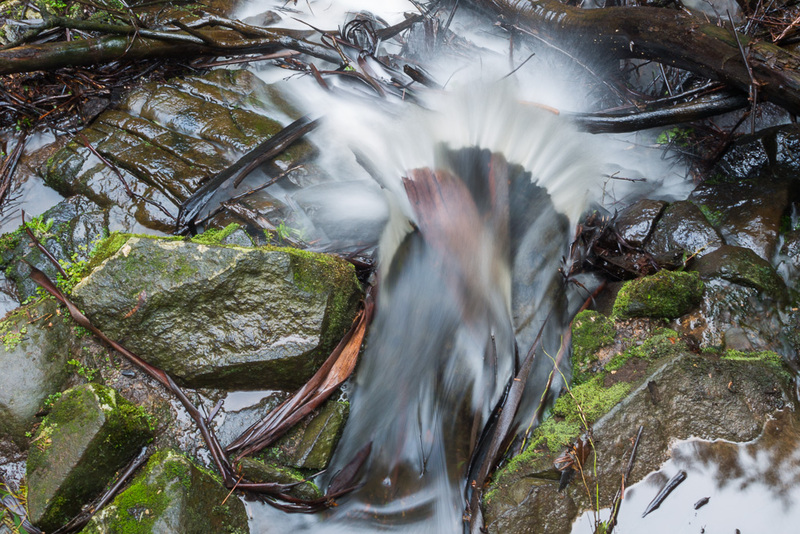 …and I managed to keep everything steady enough for some longer exposures. Finally, with a bit of stuffing around, I managed to capture what seemed to be the most picturesque part of the falls. A quick review of the photos and my waterfall work was done. Just in time as well. No sooner had I donned the backpack and a couple of blokes wandered down to the bridge. They were the first people I’d seen all day and I had a brief conversation with the younger of the two. He told me he was bringing his elderly father down to the waterfall on his birthday. It sounded okay. I did some thinking and decided when I’m 125 years old, I’d like the same done for me, but with an additional request. A 90 litre backpack, full of the best marijuana, accompanied with an imitation skull bong. If I reach that age, I might as well be pain free. Thoughts of being off my rocker had to be put to one side, as I now had to up the pace a little. The waterfall photography had eaten up some time and now with the short winter day, it was time to get the walk over and done with. …where it was even visible through the filtered mist amongst the trees. I was now walking on Hillclimb Track, but thankfully going in the opposite direction of its name (Hilldown Track?). Even though it was getting late, I couldn’t really get any speed up, as this section was pretty wet and muddy, causing me a few potential ‘arse up’ moments. 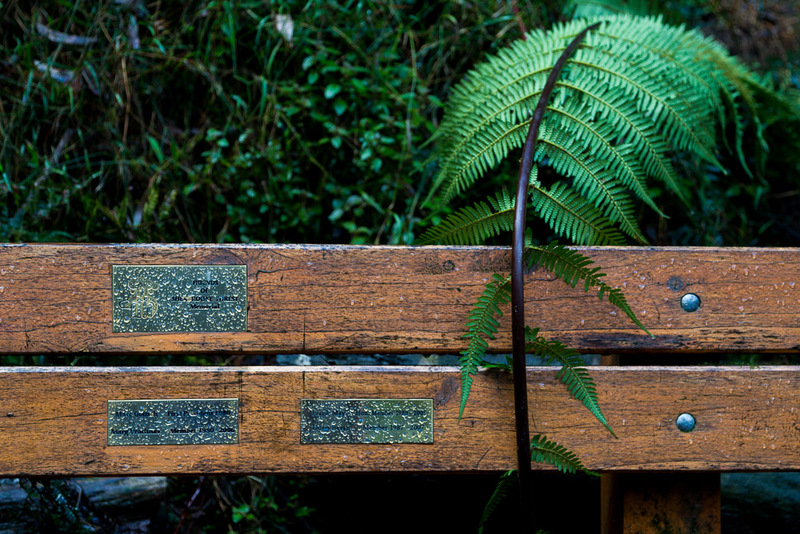 I managed to stay upright though and passed this bench somewhere, which looked quite photographic with the fern and water upon it. Where was this bench? I’ve no idea. It was somewhere on the walk though. It was also fairly dark, so the camera was parked unless something stood out. 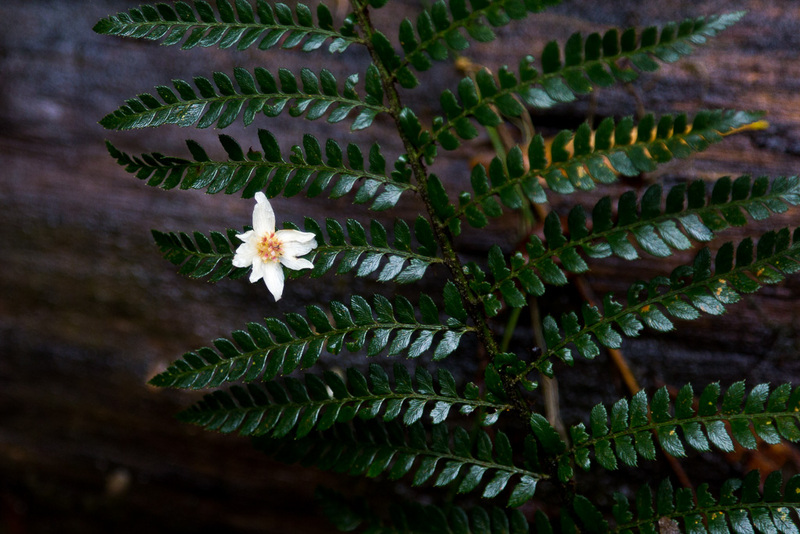 This flower against a wet fern looked quite nice. Finally though, I exited the forest and faced a stressful sprint across Monbulk Road again. This time it was late afternoon and the ‘going home’ traffic was in full swing. I’m not sure how I made it in one piece, but I’ve got a hunch it was due to my wet and muddy condition. Clearly, the drivers thought it was the Sasquatch emerging from the bush, so instinctively slowed in shock at the sighting. 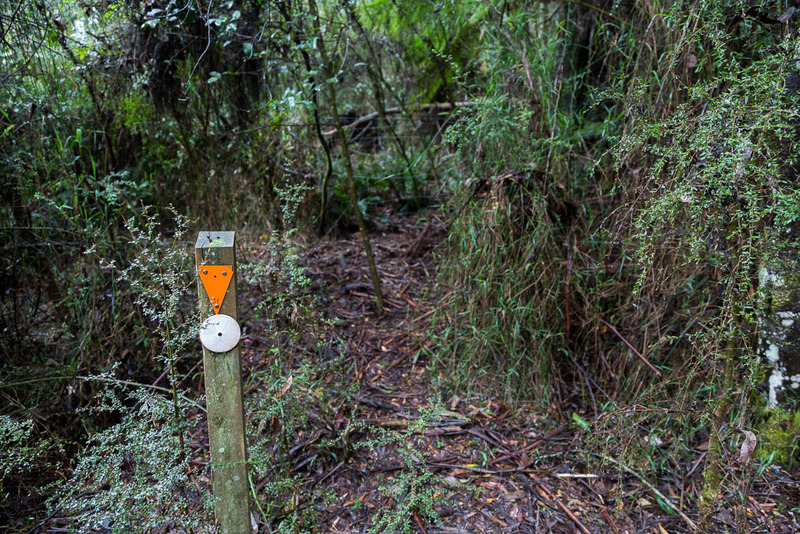 It was more or less an uphill wander along Bleakeley Track, which runs next to Monbulk Road. Being in lesser surroundings, I thought the photo taking was done for the day. Don’t ever believe it though! Along this track, something orange caught my eye. What could this be? It certainly looks like a crayfish who’d been in the wars, as he was missing some equipment. He was alive though. I was keen on a positive identification, so I emailed the photo to the Discovery Centre of Melbourne Museum. It’s my go to place for the weird and wonderful. Here’s the response. Okay, it’s a bit long, but there you go. All your questions answered in one hit. The museum has always been handy for things like this. Mind you, I sent them some other photos a few months ago and received no response. They were a series of footprints on a beach in Croajingolong National Park. I might have to revisit those footprints in another query, as five years later, I’ve still got no idea. Daylight was well and truly fading as I slogged up a hill, which then met Coles Ridge Track. I was minutes away from the carpark, but there were still some things to see. 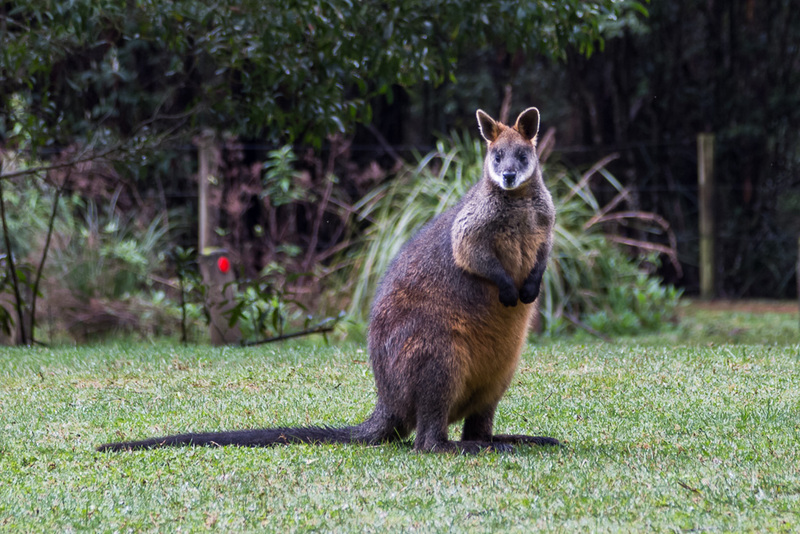 A couple coming from the other direction bailed me up by excitedly telling me there was a wallaby ahead and I really should take a photo of it. Huh? I thought they were dime a dozen up there? Maybe they thought I’d never seen one before? Anyway, what could I do, other than oblige by taking a picture of him. Returning to Grants Picnic Ground, it suddenly occurred to me I should take a photo of some of the birds still hanging around. Remember earlier on how I mentioned they were all over the place? 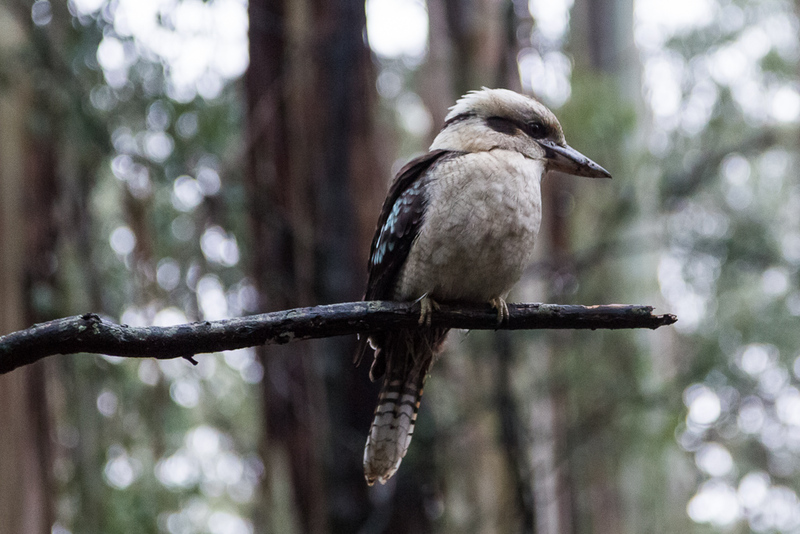 Well, there I was in practical darkness trying to capture kookaburras. It would have been so much easier about four hours earlier. When it was daylight. Another walk from the book done! The eternal 100 walks lives on. 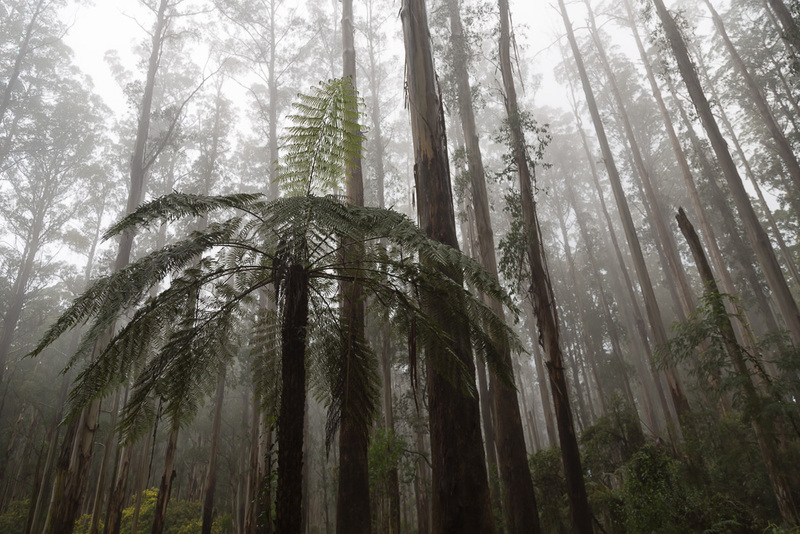 Sherbrooke Forest, Dandenong Ranges National Park is always a great spot to visit in winter. 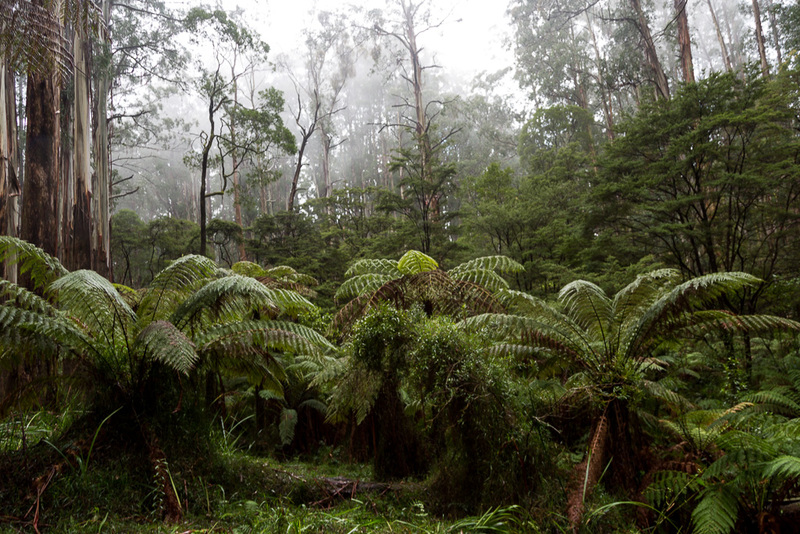 Ferns are green and mist hangs between the towering trees. 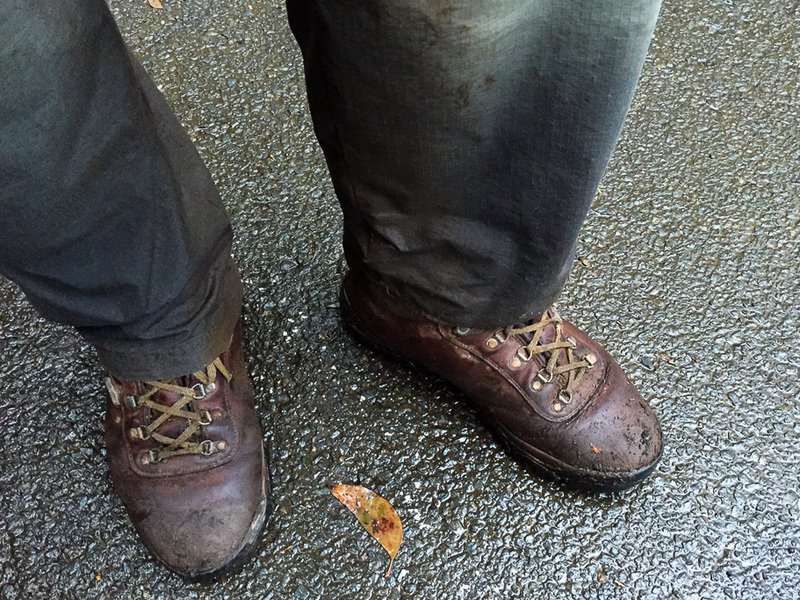 It had been an enjoyable jaunt and I must say, I was glad I’d worn my leather boots, as it’d been a soaking wet day. Is that it? Oh no, like always, there has to be something else. I discarded the boots and pants (I did change. I didn’t drive home starkers) and drove home. Upon arriving, there I was pottering around the kitchen and a couple of times I felt like something wet was on my feet. I’m not sure why I didn’t think this was unusual. 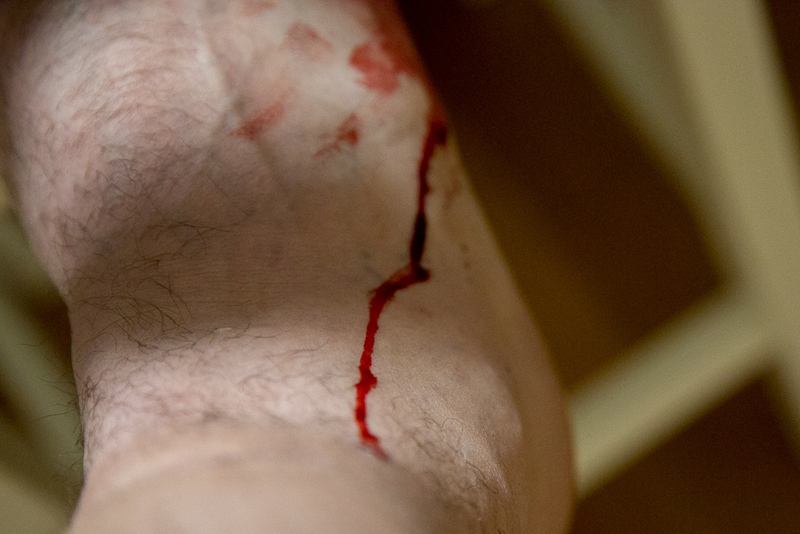 Anyway, after about five minutes I had a look and noticed a blood stream from my leg. Best of all it wouldn’t stop bleeding, which could mean only one thing. A leech. This is all great, but do you think I could find it? I checked the wound and there was nothing there. I examined my boots and pants thoroughly, but couldn’t see it. Was it in the car? No idea, but I had a good look. I can only assume it came off when I changed out of my wet boots at the carpark. Okay, next up. The Grampians. I think. Thank you for allowing the heel of your boot and your head to become acquainted. That photo is exquisite! 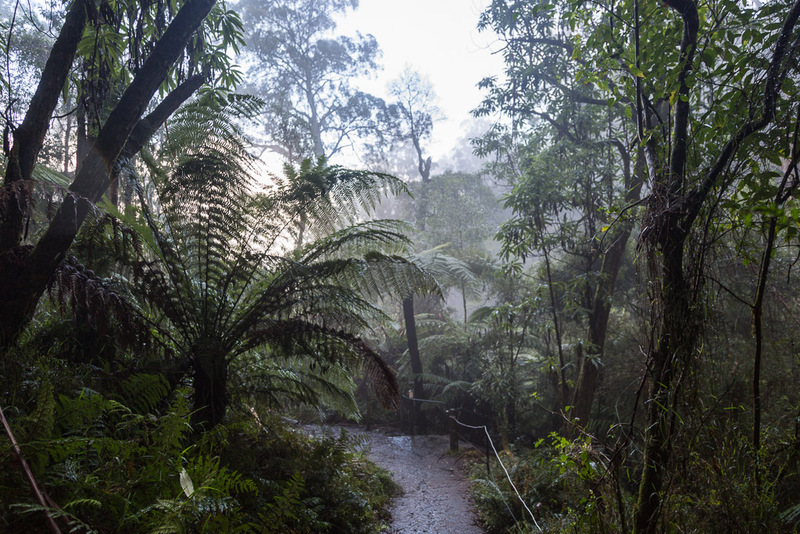 Excellent photos of a beautiful area and I think you are correct, winter and mist is better than summer in Dandenongs. 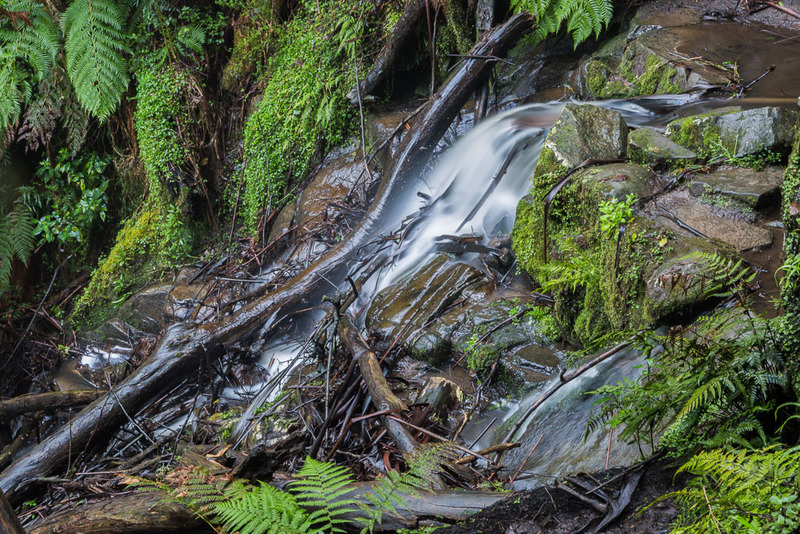 You were certainly fortunate to photograph the lyrebird and the crayfish. 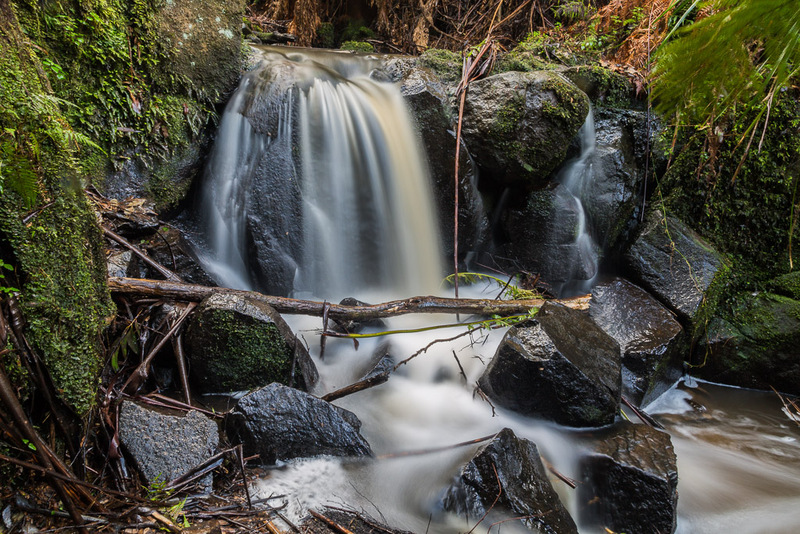 I appreciated your waterfall photos, what tripod do you carry and did you use a filter with the falls? And yes I would agree a leech, we only have ticks here and they don’t let go without a lot of persuasion. 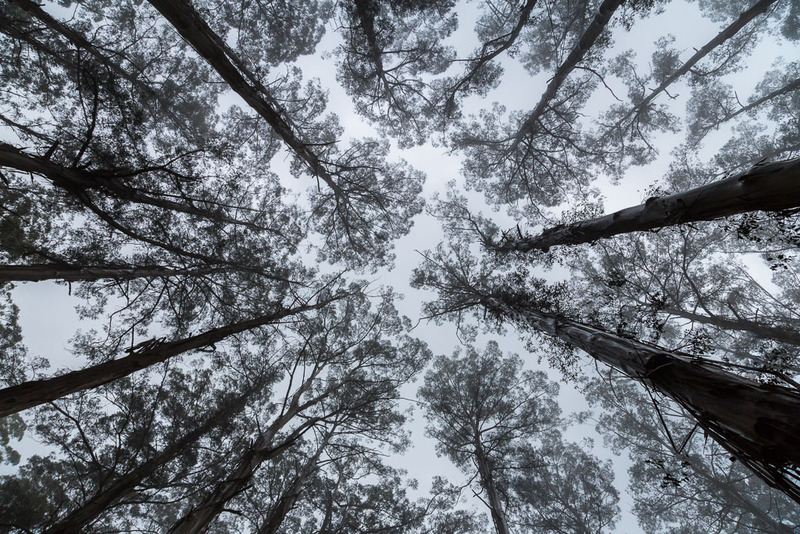 Haha… I think it’s one of my best photos for the ‘looking up at the tops of the trees’. There’s a bit of symmetry to that one compared to the million of other times I’ve tried it. Hard on the back though, not to mention the head rush upon straightening! Thanks Roger! 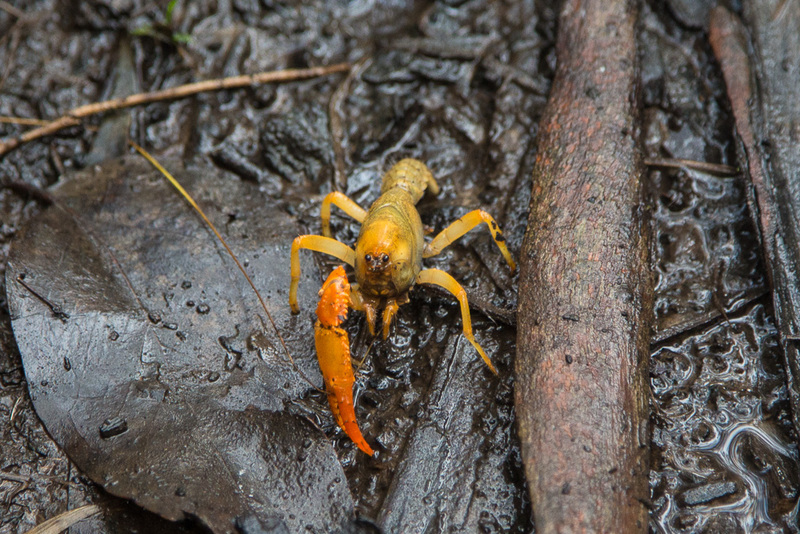 I was definitely lucky to see the crayfish, as I’d never seen one wandering around up there. Judging by his condition though, I have a hunch he’d rather have been in the safety of a hole somewhere! The lyrebird was interesting. I’ve done another walk up there recently where I saw one and went for the long photo, thinking I’d scare it away if I got closer. In the end, I crept forward until it was about five feet away, so maybe they’re acquainted with people in some areas up there! The tripod is a bit old now. I looked at before and it’s a Slik Sprint Mini II. It’s not too bad weight-wise for something that needs to hold a DSLR. I was using a Gorillapod, but it did my head in. Lighter, but endlessly annoying when I used it, so I’ve reverted to something more traditional. Actually, I’d prefer leeches to ticks! I had a few on the Croajingolong hike last year and ticks were spooky in the way they aggressively hang on when trying to get of them! I agree with AnotherShortDictator. That shot is amazing! 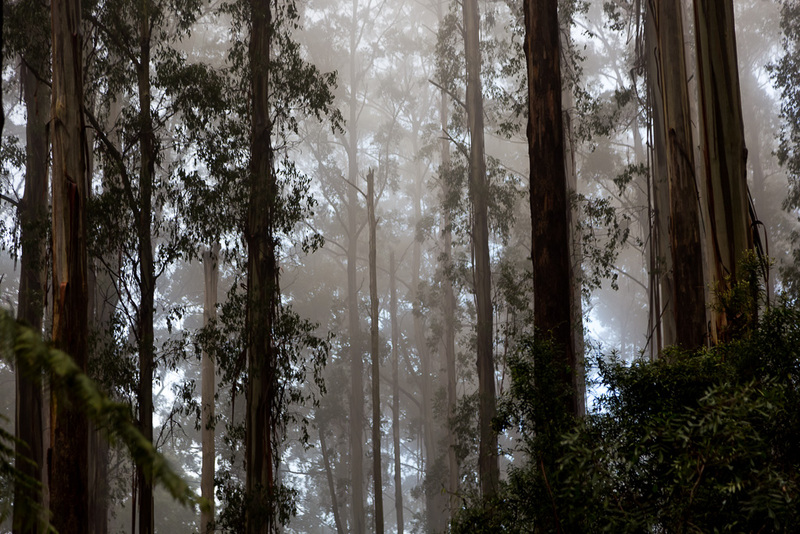 I have to say my favourite though is your header picture of the incredibly tall, straight trunks in the mist. The yellow foliage/blossoms underneath sets off the other colours, shapes and textures perfectly. I know someone who took his boots off in his fernery and ended up with a good colony of leeches. Interesting walk. There is a photo of Sherbrooke Falls on the web http://photographyhotspots.com.au/photography-location/sherbrooke-falls/ which shows them better. Maybe it needs a larger tripod? Thanks Jane. Even as I was walking around, I could tell it would be a photographic bonanza! All of that mist in the trees and wet vegetation always looks better in photos. Just some of the photos I took. I reckon I had 200 to choose from! 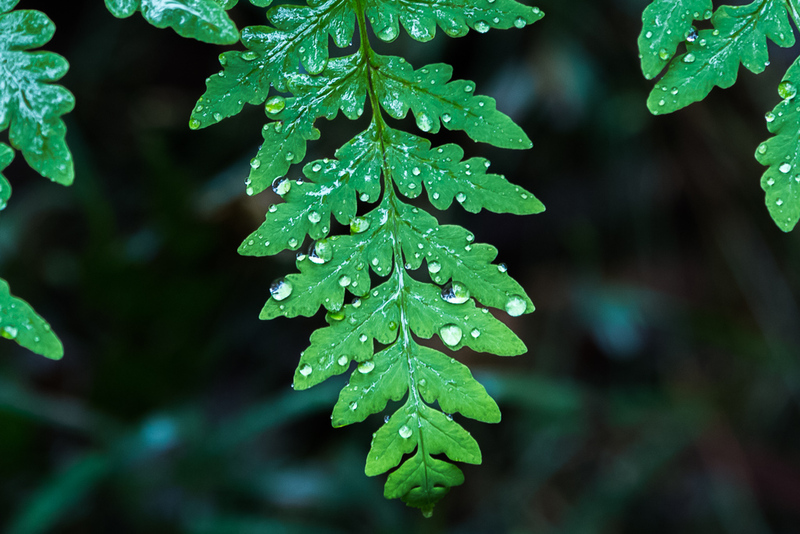 Yeah, the trade off with ferns is they look great, but you might lose a bit of blood whilst enjoying their sight! Thanks Greg, I also played with Gorilla Pods but never found them to work for me. I am exploring 2 options either walking pole supported tripod or an actual tripod, which I think is my preferred option along with a “light but tough” ball head. A day, 3 years, meh… – don’t ask me. The one thing Gorillapods drove me nuts with are their height! I had it on a coastal walk and down by the beach I had the camera about six inches off the sand. Insane 🙂 Makes sense if you’ve got something to cling it to, but even then I didn’t trust my expensive camera to stay adhering to the crappy pod legs! Makes sense for compacts etc, but in my experience with a DSLR it sucked. Really? That tick business has put me off walking over there! Haha… Yeah, I see what you mean. I give them one thing. If you’ve got a photo, they tend to answer within a couple of days. Except for my footprint photos. They’ve put that one in the ‘too hard basket’ for sure. I think it looks like a pigs prints. How a pig is wandering around a beach at the Croajingolong I’ve no idea. That’s why I wanted an expert to tell me! Nice work, Greg. A beautiful part of the world. Fabulous photography. Hope all well. Thanks Alison! Yeah, it might be cold and wet, but it’s great for photography at that time of the year. Absolutely stunning photos in this post Greg. Feel I should lurk no longer and actually comment. I’ve never really been a fan of the long-exposure waterfall shot, but there’s something beautifully surreal about yours. Nah, I have to disagree, you’re way too modest about your photography. With the technology available now anyone can take a ‘good’ photo but the art is in the 3F’s: framing, framing, framing and you got it! Blogging makes me take way more photos than I normally would. I keep taking stock shots of something, only as I think I may have to describe the scene later and it’ll need a picture to help me do so. I don’t know if this is good or bad?! At times I do think I should be a little more creative with it. Horses in the Dandenongs? That would seem weird these days! Amazing photos! I’m so inspired, thank you!